In case you missed it, this was our most popular story last month. A fascinating look at the great Broward Health North staff's response to the Parkland shooting. FROM LEFT TO RIGHT nurse Lea Ann Chidester; medical director of the emergency department, Dr. Evan Boyar; nurse Rebecca McAndrews; medical director of trauma services, Dr. Igor Nichiporenko; and hospital CEO Alice Taylor. Photographed in the emergency department at Broward Health North by Debra Todd. On Valentine’s Day last year, Code Green was called at Broward Health North on the Pompano Beach-Deerfield Beach border. Code Green — the code called to initiate protocol for a mass casualty incident — signaled the entire hospital that a nearby tragedy was underway. The surgeons, doctors, nurses and support staff sprung to action to respond to Parkland’s Marjory Stoneman Douglas High School shooting, the third most tragic school shooting in U.S. history. 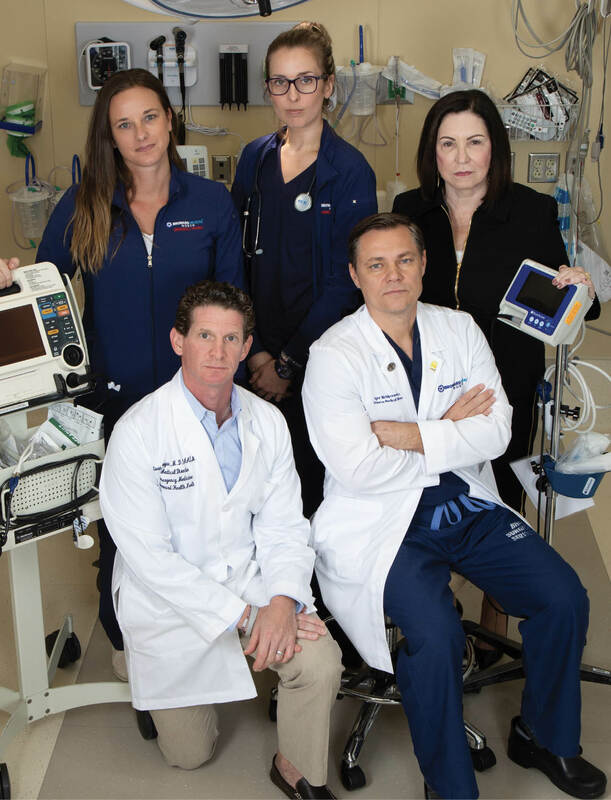 Together, the emergency room team at Broward Health North’s level two trauma center saved six lives. These are their stories. On Feb. 15, 2018, Dr. Igor Nichiporenko, the chief trauma surgeon and trauma medical director at Broward Health North, exited the emergency room in the dark morning hour after midnight, adrenaline still raging after hours of emergency surgeries. He had just finished one of the most intense days ever endured in his eight years as a trauma surgeon at Broward Health North. On his way home to Lighthouse Point to his pregnant wife, an ICU nurse who was off that day with their 4-year-old son, he stopped at the 24-hour Walgreens at the corner of Sample Road and Federal Highway. He bought a Valentine’s bouquet of a dozen red roses wrapped in colorful plastic — the only flowers available next to the day-old newspaper stands not yet displaying the day’s headline tragedy — and returned home with a deep sense of gratitude that his wife and son lay peacefully in their beds. That day, Dr. Nichiporenko had seen two families lose loved ones — the families of two victims who were both fatally injured during the Marjory Stoneman Douglas shooting. They had been transported, along with six other victims and the shooter, to the Emergency Department at Broward Health North. Dr. Nichiporenko was just one of a united team of surgeons, doctors, nurses and support staff that day who worked arduously to minimize the damage done by the third most tragic school shooting in U.S. history. It was the team’s professionalism, expertise and coordination, coupled with Broward North’s newly-expanded level two trauma center, that made it possible for six families to welcome home their loved ones that dark day. That afternoon, Dr. Evan Boyar, Broward Health North’s chairman and medical director for emergency services, was working from home, about a mile away from Marjory Stoneman Douglas High School in Parkland. It was after 2pm and school was just letting out, so his wife had gone to pick up their two children, a 10-year-old and an 8-year-old, from elementary school. While on the road, she noticed a lot of traffic and speeding vehicles and called her husband concerned. Dr. Boyar, distracted by work and having seen plenty of speeding cars in the neighborhood before, thought little of her concerns and dismissed her casually, telling her he would see her when she got home. When he hung up the phone, he immediately received a call from the Chief of Coral Springs Fire Rescue. Nurse Rebecca McAndrews was the charge nurse on duty that day who took the call from dispatch in the emergency department before Code Green was called. “We have a red phone that’s directly connected to dispatch…When that red phone rings we know it’s usually something serious that’s coming in. It rang and they said there had been a shooting at a high school. They didn’t know how many victims there were going to be, but said to expect a lot of casualties. It’s always something shocking whenever that phone rings. We know it’s not going to be something ordinary like we deal with on a day-to-day basis. Nurse Lea Ann Chidester was off that day, at home expecting a lazy afternoon. Her husband was outside in the Florida sunshine washing his car when she flicked on the news and learned of the shooting. She called out to her husband, a BSO firefighter-paramedic, to alert him. When he asked her where the shooting was and she responded “Parkland,” he reminded her that her hospital is the closest trauma facility to Marjory Stoneman Douglas High. “I said, ‘Oh my God, you’re right,’” she said. The realization hit her abruptly. “Immediately I started getting my scrubs on in anticipation and then I got, as part of a management team, an alert on my phone,” she said. Nurse Chidester drove in silence to the hospital from her home in Pompano Beach, mentally preparing herself for the unknown awaiting her. “I remember it felt like it took me three hours to get to work because I was determined to get there,” she said. Dr. Nichiporenko was in a monthly meeting with the hospital’s CEO, Alice Taylor, when Dr. Boyar called to tell him about the shooting. “He said ‘We have an active shooter in Parkland High School. Expect to receive multiple casualties, pediatric trauma with penetrating injuries….then, about two or three minutes later, Code Green was activated for the whole hospital,” Dr. Nichiporenko remembered. Code Green is the code called at Broward North when a mass casualty incident has occurred. It activates a protocol for staff to take specific roles and positions within the hospital to prepare for, and subsequently treat, multiple trauma victims. Coincidentally, on the 23rd of September 2016, Broward Health North had completed an active shooter Code Green drill where the team practiced taking care of multiple casualties from multiple gunshot wounds. That training prepared the hospital team for the reality of the day they were now experiencing. At first, however, Dr. Nichiporenko said some thought it was just another drill. As the hospital was springing to action in response to the Code Green announcement, Dr. Boyar was driving like a mad man, racing from his home in Parkland to the hospital following closely behind emergency rescue vehicles coming from Marjory Stoneman Douglas High that were taking the same route he drives to the hospital. Dr. Boyar joined Dr. Nichiporenko, charge nurse McAndrews, and an entire team of other doctors, nurses, surgeons and other personnel at the command center in the emergency department. “That’s where it all started,” said Dr. Nichiporenko. “We had a command center at our charge nurse desk and then we had a central command center,” said Dr. Boyar. “From the command centers, duties and responsibilities get delegated, and the key is to adhere to your duty and responsibility. If you don’t stay in your lane, that’s where confusion takes place. While his staff sometimes dislikes the drills, considering them “monotonous,” Dr. Boyar said that that day, everyone was tremendously thankful for having had the practice. Nurse McAndrews was in charge of the command center at the nurse desk. Even before Code Green was called the ER was busy, so her first job was to get as many patients discharged, triaged or moved to make room for the incoming trauma victims. “Then we had to make sure the trauma rooms were each set up with a trauma team of nurses, paramedics, respiratory therapists, ER doctors — we were making sure everyone was where they needed to be. A number of additional medical professionals from outside the hospital also rushed in to help. The patients came in groups of three or four, said Dr. Nichiporenko. “I think the first patient that arrived was in the first 15 minutes,” he said. “There was not really time to stand and wait and think of what’s coming, or what’s not coming. We were preparing for victims to come in and preparing to start working. As the patients arrived, medical teams dispersed into their respective zones. In total, Broward Health North received nine patients, which included eight victims and one suspect. Of the nine patients, four patients were in non-life threatening condition, three patients were in life-threatening condition and two patients expired. Dr. Nichiporenko conducted three emergency surgeries, the last one ending just past midnight. Though he was in surgery late into the evening, the rush in the emergency department was over in just a few hours. From that point on the ER was back open for business. “And then by 6 o’clock, it was like you would have never had known — except for the media outside — what happened inside of our emergency room,” McAndrews said. Though by appearances the emergency department was “back to normal,” Dr. Boyar said hospital personnel was not. He remembers how the emotional atmosphere completely shifted after the all-clear was given. Dr. Boyar and CEO Taylor held a debriefing meeting in a conference room off the east wing of the ER where staff packed in and overflowed into the hallway. “It was a good way for us to have a moment of quiet and express our feelings and start the process of healing,” she said. The debrief lasted only about 20 minutes. The ER was still open, with a waiting room full of new patients. While the ER conference room was swarmed with hospital personnel for the debriefing, the hospital cafeteria was packed with the friends and families of Marjory Stoneman Douglas High students, all agonizing and waiting for news. CEO Taylor called Imperial Point hosptial, which has a behavioral health unit, to recruit as many grief counselors and therapists to come support. “At the end of the day, when things were winding down, I went to the cafeteria…and that was just the most tragic moment I think all day — seeing those parents, knowing that they don’t know where their kids were,” said Taylor. Seeing the parents and families was also the most difficult part of the day for Dr. Boyar. In retrospect, Dr. Boyar, Dr. Nichiporenko and CEO Taylor all said they are proud of the way the hosptial responded that day. “The whole hospital worked like a well-oiled machine,” said Dr. Boyar. The closeness of hospital staff was a major factor in the hospital’s ability to respond well, Dr. Nichiporenko said. The new emergency department at Broward Health North, which underwent a $26 million expansion in 2016, also aided in the hospital’s ability to act efficiently, Dr. Nichiporenko said. Maddy Wilford, one of the surviving Marjory Stoneman Douglas teenage victims who was operated on at Broward Health North following the shooting, is especially grateful. At a press conference almost two weeks after the shooting, she addressed a crowd inside the hospital, sitting at a table with her parents, Lt. Laz Ojeda of the Coral Springs Fire Department, Dr. Nichiporenko and Dr. Boyar. “I’m so grateful to be here, and it wouldn’t be possible without those officers and first responders and these amazing doctors,” she said. In the wake of the Parkland tragedy, Dr. Nichiporenko knew he wanted to do something constructive and forward-thinking to help minimize the damage of mass casualty events in the future. He started participating in Stop the Bleed, a training program that teaches citizens how to quickly stop a victim from bleeding out using a tonic and medical materials to pack a wound. The first 60 minutes after a traumatic injury — a period of time called the “Golden Hour” — are critical, said Dr. Nichiporenko. If a bystander can stop a victim from hemorrhaging, the victim is much more likely to survive. “My personal participation with Stop the Bleed makes me feel like there is something I can do personally,” said Dr. Nichiporenko. “Not everybody is in the position to stop or prevent this [mass casualty incidents] from happening, but at least when they happen, I can help people to know how to stop the bleed, so that more lives can be saved. This was my resolution to this problem. “As a physician, I can actually do something about it by trying to minimize the harmful effect of this kind of violence. It can happen in the supermarket, it can happen in the library, it can happen in the church, it can happen in the bus station. As regular people, we aren’t politicians; We are just doctors and patients. What we can do for each other is to train ourselves how to stop the bleed. Ideally, Dr. Nichiporenko said he’d like to ensure that every public place has an easily accessible trauma box with materials to stop bleeding alongside other life-saving materials like AEDs. 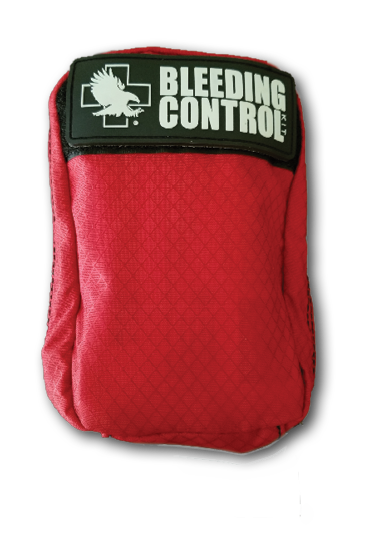 He encourages public places to invest in a Stop the Bleed medical kit. The hospital is also accepting donations of Stop the Bleed medical kits. You can order them online at bleedingcontrol.org and have them mailed to Point! Publishing at 2436 N. Federal Highway. P.O. Box #311, Lighthouse Point, FL 33064. Point! Publishing will deliver the kits to Broward Health North. The next Stop the Bleed course will be held at Broward Health North on Saturday March, 30 in the Conference Center. 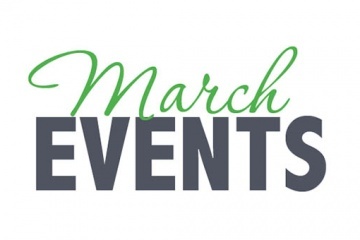 To RSVP for this event please call 954-759-7400 and select option five, or visit BrowardHealth.org/Events.